There are various preparations that can be done with squid. The simplest one is grilled over an open fire. 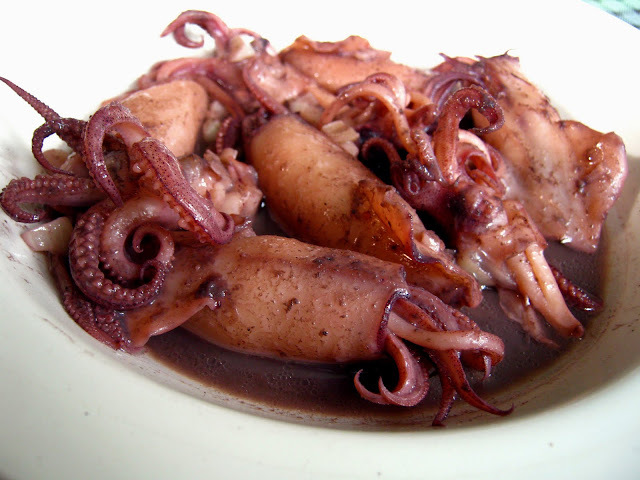 Adobong Pusit (Squid Adobo) Recipe is a stewed squid in soy sauce, vinegar, and other ingredients. The tricky part with squid is, no matter what method of cooking you do with it, make sure that you do not overcook it as it becomes rubbery. 1 Wash and clean the squid by removing the eyes, membrane, and stomach. 2 Boil squid in saucepan with vinegar, garlic, pepper, soy sauce, salt, and little water. 3 Simmer until the squid is tender. Do not overcook. Drain and set aside. Save the sauce. 4 In a skillet, sauté garlic (taken from the sauce) until brown, then add the onion, and tomato. 5 When onion becomes translucent, add the squid and laurel leaves. 6 Add sauce and season with sugar according to taste. Simmer until a thick broth is formed, then serve.